Every year I am always overwhelmed by the sheer volume of good and abundance in my life. 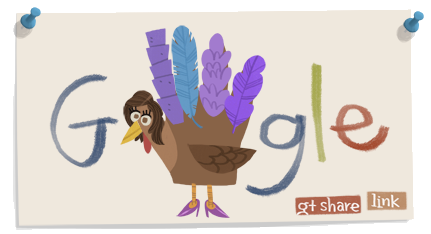 Yesterday I had fun with Google's Thanksgiving doodle. Mashable and PC World had write-ups about it - and give you more info on how to click n' play. 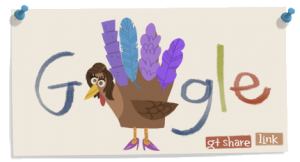 I have to admit, it is fun to sit here clicking and customizing my very own turkey doodle. PS: you can check out 2009's Snoopy Thanksgiving doodle, and 2010 Dinner-themed doodle complete with a link to recipes.